A stall guard is a very useful tool in a stable. They allow the stall door to be open for whatever reason but discourage the horse (or pony) from leaving the stall. It is a common tool in barns across America. Being stuck in a 12 x 12 stall for most of the day can create stable vices and boredom in the horse. Stall guards are great. They allow a horse’s stall to be ventilated as well as provide the horse with visual and tactile stimulation. As with anything else, safety has to be the #1 concern when choosing a horse stall guard. With all the different styles available on the market, it can be hard to choose the right one for your barn. In this article I’ve outlined some factors to consider for each of the major types of stall guards. Horses seem to be able to hurt themselves on anything and everything. There are a few safety concerns you want to keep in mind when you are looking for a stall guard. Holes give a horse a place to get a foot caught. Try not to have any. Solid construction is best. When using two or more clips on each side, you are creating holes. Keep that in mind. If a horse is playful he could potentially get his leg caught in the small space between the clips. Consider quick release attachments. If your horse does get stuck, the easier you can release him the better. Consider velcro attachments for the snaps, they will break away more easier when challenged. Keep in mind that if your horse is the type of horse to challenge or play with his stall guard it becomes even more necessary to ensure you are using the safest type of stall guard possible. Some horses are going to be just fine with a stall guard full of holes and never have an issue. Other horses seem to get hurt just walking to the paddock and back. I give my opinions below based on 25 years of horse experience and having owned or trained hundreds of horses. That being said, you should always make the decision that is best for you, your horse and your budget. Nylon stall guards are the ones I most commonly see in barns across America. Honestly, they are my least favorite. I think they are popular because they are commonly seen and easy to attain. Some nylon stall guards present, in my opinion, a big safety risk. It’s not the nylon material that is the problem. It’s the holes or gaps where a horse’s foot or head can become caught. This stall guard shown here is one of the most dangerous types. This one shown is made by Weaver. The thing is, companies keep making them because people keep buying them. The large holes in the center of this one are a prime spot for something to get caught on. A horse doesn’t even have to be playful to get stuck. What if he rolls a little too close to the stall door and gets a back foot caught? It is a disaster waiting to happen. Now, this doesn’t mean that all nylon stall guards are bad. The stall guard is still nylon, and still adjustable, but a much safer option. Keep in mind that with any clip-on type stall guard, the sides still have the potential of being able to trap a hoof. Kensington also makes a great stable guard that comes in a variety of different colors. Weaver So many holes to catch hooves. Roma Solid construction, very little space for horse to get stuck. Kensington Solid construction. Very little places for a horse to get a hoof caught. Stall chains are pretty darn safe when used by themselves. There is not really anything for them to get caught on. The thing is though, by themselves they don’t have much of a visual presence for the horse. Most quiet type horses would probably be fine with just a stall chain but fractious or playful horses are more likely to challenge it. Stall chains like this one can also be used in conjunction with a stall guard for horses that really challenge the barrier. Of course, when using a stall chain on your horses stall with a stall guard, be aware that a horse could get a head or foot trapped between the two objects. These stall guards are also called cable stall guards and are also fairly safe options for your barn. The great thing about these cable stall guards is that they often come in custom colors to match your barn colors. These stall guards are one of the priciest option but also, one of the safest. They come in a variety of different options, usually with a yoke that makes it convenient for your horse to stick his head over but still prevents him from being able to bite at his neighbors or blankets that may be hanging outside the stall. These are typically made of meshed metal and swing open and shut forming a tight fit in the door frame. When looking to purchase a metal stall guard, it very important to make sure that you measure the stall correctly to ensure the product you order will fit. These are also called stall gates. When it comes to choosing the right stall guard for your horse there are a lot of factors to consider. First and foremost, consider your horse’s temperament and safety. Which product will be the safest way to keep him / her confined. After safety has been addressed, and you’ve made the right choice for your horse, then you can start to look at style. In all but the metal stall gates, you can choose one or more colors to fit your barn. In fact, it is even possible to order custom embroidered stall guards with your horse or stable name on them. Is your horse the type to get bored easily? 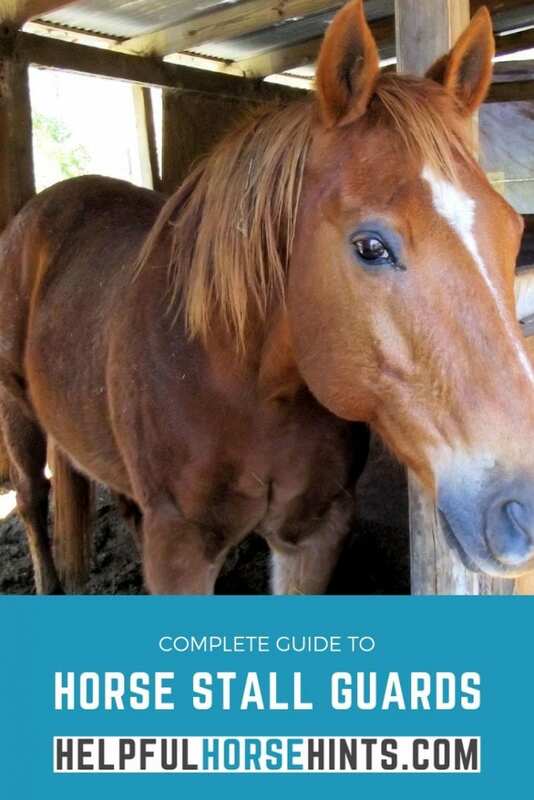 If so you may want to check out these great boredom busting tips for horses!